Construction of this building began in 1628, in accordance with a bequest by Goldsmith to the Crown, George Heriot, of 25,000 pounds for the purpose of schooling "puir faitherless bairns". 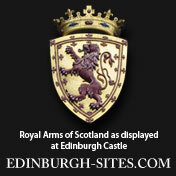 It was sited outside the City walls next to Greyfriars Kirk and overlooked by the Castle to the North. of Scotland during the Third English Civil War. In 1859 it began to function as the intended charitable school initially with just 39 orphaned children. In the 1880's it began to charge fees, though still provided free education to "foundationers" (fatherless children) as it does to this day.